Choose from normal to dry or combination to oily with an instant eye makeup remover and bag. 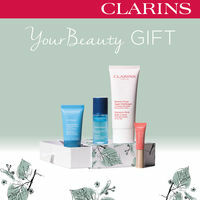 Great value and saving with this gorgeous sets from Clarins. Inspired by the treatments and traditions of a day at the spa, experience ESPA’s collection of hand-picked forumlas – your tools to recreate your own spa experience at home for a renewed sense of wellbeing and inner calm, and beautiful skin from head to toe. Refining Skin Polish 55ml, Restorative Candle 200g, Restorative Bath Oil 50ml, Restorative Body Oil 50ml, Replenishing Face Treatment Oil 30ml. Skin Brush, Pink Hair & Scalp Mud 55ml, Smooth and Firm Body Butter 180ml, Overnight Hydration Therapy 55ml, Soothing Eye Lotion 100ml. Optimal Skin ProCleanser 100ml, Optimal Skin ProSerum 30ml, Optimal Skin ProMoisturiser 55ml, Overnight Hydration Therapy 55ml, 24-Hour Replenishing Eye Moisturiser 25ml, Restorative Body Oil 50ml, Pink Hair and Scalp Mud 55ml. The first step towards plumper, youthful, radiant skin. The formulas in ESPA’s Replenishing range use powerful naturals that work together to gently quench and help counter dehydrated skin. Hydrating Cleansing Milk 200ml, Hydrating Floral Spafresh Spritzer 100ml, 24-Hour Replenishing Moisturiser 55ml, Replenishing Face Treatment 15ml. From balanced lifestyles to diet and skin – getting it right brings lasting harmony. Plant extracts found in ESPA’s Balancing range have got skin covered, working to clarify, hydrate and combat oily and combination skin. Balancing Foam Cleanser 150ml, Balancing Herbal Spafresh Spritzer 100ml, 24-Hour Balancing Moisturiser 55ml, Balancing Face Treatment oil 15ml. ESPA’s bestselling Optimal Skin range harnesses the power of some of nature’s most potent miracle workers, in plant, marine and aromatherapy actives. This advanced range of responsive products works in harmony with skin to nourish, balance and restore radiance, while optimising skin’s long-term natural function, for lasting beauty. We may not be able to stop time, but with nature’s help we can look our beautiful best at every age. Our age-defying collections works to boost hydration and elasticity, smooth lines, soften wrinkles and revive radiance. Hand-poured and infused with pure essential oils, allow the citrusy Cardamom and warm Black Spruce to comfort, while the woody anchor of Virginian Cedarwood and Javan Vetiver envelop you, taking your mind to a glowing fireside. Allow divinely calming Frankincense and Myrrh, at the heart of our Soothing blend, to help relax the senses and calm the body and mind, as you step into a bath laced with Soothing Bath Oil. Enhance the experience by massaging Soothing Body Oil in circular motions into wet skin before bed, for beautifully scented, hydrated skin. Close your eyes behind your silk sleep mask and allow the comforting aroma of lavender from your Overnight Hydration Therapy mask to help you drift off. Highlight your complexion and decollete with this golden highlighter palette and reveal your inner radiance. A non-sticky oil derived from plant extracts to leave lips feeling nourished and comfortable, with a sheer finish. Limited Edition shade Red Berry Shimmer offers an ultra-glossy shade of red with adde3d gold pigment to reflect the light and give the appearance of a fuller natural lip. The classic formula features multiple nylon bristles to hug each and every lash. It’s tapered shade follows the lashes’ natural curve to instantly deliver a generous amount of product. The warm gold shade illuminates and reawakens lashes just in time for the party season.